My family and I stayed at this cabin in October 2016. The cabin was spacious and very clean! The view from the back deck was wonderful. It was a short drive to downtown Bryson City. My only suggestion would be to clearly mark the turns heading up to the cabin, the dirt road is difficult to manage at night. THe cabin was so nice! We ame to ride the Polar Express. 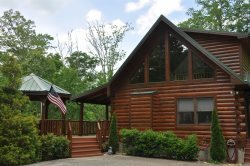 This cabin was easy to find and close to Bryson City. We had a nice and relaxing mini vacation. We will be back for sure. We so enjoyed your beautiful cabin this weekend! We came up to kick off our kids Thanksgiving break and to Celebrate my husbands 46th birthday. The view is stunning. At night the planed Venus was visible through the telescope. The kids loved that. The hot tub was a hit with us all. We loved looking at the cabin and how it was built. We will be back soon. Surprised my wife for her birthday with a trip to the mountains. It was out first time renting a cabin in the mountains. It was incredible and peaceful. We will be coming back that's for sure. It was the perfect getaway. The view was spectacular. The cabin is beautiful and the view was amazing. My family and I enjoyed our weekend. Thanks so much for sharing your cabin. Our weekend here was great! We came to ride the Polar Express as a celebration for our two kids birthdays this month. We hope to return again soon. We had so much fun while here and can't wait to come back. Cathie was wonderful! She helped me book the property and helped me figure out how to use the oven (haha). Everyone was so prompt in answering the phone and emails - top notch customer service.